Jersey Shore Convention & Visitors Bureau and Hotels Unlimited will host a Tourism Expo on Wednesday, May 18th, 2011 at Ramada Toms River from 5:00pm to 8:00pm. Free Admission, prizes and food. Come see all the Jersey Shore has to offer with a live WPLJ Broadcast, local vendors, a preview of 2011′s spring and summer events and networking. The CVB will also be unveiling the new Jersey Shore icon and hosting a press conference to announce the summer long contest that will accompany the use of the icon. It will be a very fun event and I will be representing Comfort Inn Middletown-Red Bank joining our partners in tourism. Directions to Ramada Toms River can be found here. There are some exhibition spaces still available, if you are interested contact Dana Lancellotti at 732-905-2626. What do you think about that? I’m not sure how I feel about “Now That’s New Jersey” being the new state slogan to promote tourism. I feel like it can be made negative way too easily and New Jersey gets enough undeserved criticism. Tourism is a critical component of the state’s annual revenue generators and employment sector. Tourism affects everyone, like it or not. Want to learn more about what the leaders of New Jersey have planned for 2011 and beyond? New Jersey’s newly appointed Director of Tourism, Grace Hanlon, will be on hand Friday April 15, 2011 to speak at the Monmouth Ocean Development Council’s April General Membership Luncheon. She will share the results of the industry’s survey on the trends and impact of the tourism market in Monmouth and Ocean Counties, and detail the state’s plan for a new marketing campaign for 2011. Tourism is a driving force in New Jersey’s economy that directly, or indirectly, affects nearly all businesses. If you were unable to attend the Governor’s Conference on Tourism a few weeks ago in Atlantic City, this luncheon is an excellent opportunity to find out what you missed. There is a Q&A session planned and Grace brings a lot of energy and promise to this new position for her. The luncheon will take place at The Breakers in Spring Lake from 11:30am to 1:30pm. Co-sponsored by the Jersey Shore Convention and Visitors Bureau and the Long Beach Island Destination marketing Organization and presented by MODC’s Culture and Tourism Committee of which I am a member. The cost of the luncheon is $39.00 for members and $54.00 for non-members. For more information on this event and to register, click here. The Eastern Monmouth Chamber of Commerce Super Expo 2011 Committee (disclosure: I am a member of the Chamber and Expo Committee) arranged for Eric Taylor, author of Mastering the World of Selling to come and present on best business expo practices yesterday morning at the Staybridge Suites in Eatontown. Eric brought his high energy, savvy sales and engagement practices to the group after a masterful introduction by Tom Fraim, Chair of the Expo Committee. I took notes (because I am kind of nerd like that) and I figured I’d share some of the important touch points on preparing for and presenting at a business expo. Micro Marketing: Now is the time to be thinking about and ordering your promotional products and giveaways. A good amount of lead time is 3-5 weeks. Donna and Dale Szakats from Initial Impact recommend giving out a useful tool that will keep your business top of mind with your customer. Pre-Marketing: Let your contacts know that you are exhibiting at/sponsoring the event and make use of the “Golden Ticket” above to invite them to attend. Don’t forget to include contacts in your social networking platforms on-line, email marketing programs and your phone lists. Be sure that your are not sending emails to people who have not “opted in” to receive your emails. Without the opt-in, you are sending spam and people really don’t like that. Business Description: Each exhibitor will receive a 30 word blurb in which to describe their business in the event program that will be handed to each guest at the door. Put some thought into what you want to say and the 30 words that best describe your business to a potential customer. Prepare Your Follow-Up Pieces: Believe it or not you will be doing yourself a great disservice if you don’t have your follow up ready to go before the event. There is the “Law of Diminishing Intent” that comes into play after 48 hours. If you can get requested information into the hands of potential customers as soon as possible, it’s puts you at least one step ahead of your competition. Remember – No follow-up, no sale. Strategize: One of my favorite sayings is “If you fail to plan, you plan to fail.” This is true with a business expo and fail may be the equivalent of fumbling through your interactions awkwardly and looking more buffoonish than professional. Make a plan. What are your goals? When setting them a good rule of thumb is to use the SMART goals system whereby goals are: Specific, Measurable, Attainable, Realistic and Timely. Write AND practice your elevator pitch or 30 second commercial so you are comfortable with it. Be sure to sell your benefits and value to a potential customer. What To Bring: Make your booth visually pleasing. Be sure to have plenty of business cards, colorful and attractive collateral (no one wants to carry around a photocopy) and anything you feel best represents your product or service. Be sure to also bring an “Expo Survival Kit” that includes Altoids or other breath mints and hand sanitizer. Door Prize: Donating a door prize will earn you extra exposure at the event as well as create an opportunity for a potential customer to try your product or service. If you don’t work in an industry that necessarily can giveaway something, consider purchasing a restaurant gift card, iTunes gift card or the like to give away. I remember last year I won a $25 gift card to Applebee’s from Lowy’s Moving Service. Yes, a year later I still remember. Networking: Arrive at the event early and plan to stay late. Make the most of the time you will have in front of a captive audience that are as eager to learn about your business as you are to talk about it. Be sure to listen as well. One of the biggest values that comes out of an expo is the opportunity for your new contacts to refer business to you. Attitude: Engagement is key to success and connecting with people. Smiling; looking inviting will make people feel more comfortable talking to you. Be approachable, put the cell phone away for a few hours. You’ll live. How To Handle A “Hawk”: If you have exhibited at a business expo before, you’ll recognize the “Hawk” right away. He/she is the one who took full advantage of the free entrance and walks around to every booth to hard sell their product or service. You stand as a captive audience stuck at your table with no escape. Well, never fear, here’s how to handle the hawk gracefully. Allow them to get through their elevator pitch, (hey you never know) but if it goes on beyond that offer out a handshake thank them for stopping by and offer to connect online through Linked, Facebook or Twitter. Have Fun: This is most important so I decided to put it first. There is a lot of energy and people at Super Expo, enjoy the experience. Don’t Judge A Book By It’s Cover: Treat everyone equally. You never know who might be your next biggest customer or referral source. Go First: Be the first one to speak and introduce yourself. This way you have control of the direction of the conversation. Time is $$$: Be brief and upfront with what you have to offer. Quickly qualify and disqualify potential buyers. Don’t let someone who is a dead-end block you from speaking to someone who looks interested. Like the “hawk” offer a handshake, thank them and move on. Booth Time: If you are exhibiting alone, it is a good idea to remain stationed at your booth to answer questions and talk with attendees. If the booth is staffed with more than person, take the opportunity to walk and work the floor. Get to know the other exhibitors. Don’t stand or sit behind the booth be out front and approachable. What To Wear: Look as professional and presentable as possible not only are you selling your product or service, in a way you are selling yourself as well. If you have attire with your logo on it, by all means wear that. 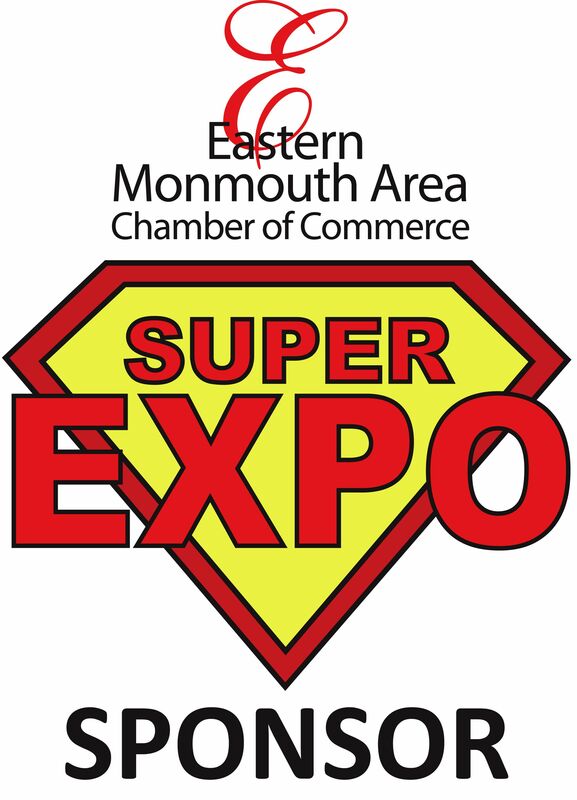 Super Expo will be on Wednesday, April 27th, 2011 from 4:00pm to 7:30pm at Branches Catering in West Long Branch. All exhibitors and sponsors will have a 3:00-4:00pm networking hour to meet and greet. Comfort Inn Middletown-Red Bank is a proud sponsor for the second year in a row. Lou Russo will be hosting from 94.3 The Point Lou & Liz in the Morning and Eric Taylor will be our emcee. There will be close to 100 exhibitors and we are expecting between four and five hundred attendees. There are no bad exhibit spots at Super Expo. Food and drink are spread throughout the event rooms. You can see photos taken by Lewis Sasaki of Sasaki Photography LLC on Facebook. He will also be the official event photographer. Eric Taylor will also be presenting at the Eastern Monmouth Area Chamber of Commerce Business Networking Breakfast on “Building Your Personal Brand”. The date is set for Wednesday, April 13, 2011 from 7:45am to 10:00am at Bamm Hollow Country Club located at 215 Sunnyside Road Lincroft, NJ. The cost is $20 for members and $30 for non-members. What are your best practices when exhibiting at a business expo? Please share your tips and advice in the comments below. Th e Art of Networking Breakfast Seminar will be presented by the Eastern Monmouth Chamber of Commerce and sponsored by Red Bank Limo this coming Wednesday, March 9 from 8:00am to 11:00am at the Doubletree Hotel in Tinton Falls. Bill Atkins, President of Red Bank Limo and I are active members of EMACC serving on committees, attending events and working to build the value of membership with the Chamber. We have seen the results of being seen and heard and want to encourage anyone looking to learn more about the chamber to attend this event. Red Bank Limo was founded in 1987 by Bill Atkins and initially focused on the wedding and prom business. Over time the business model evolved to focus on corporate travel. For many years, the company was known as Celebrate Limousine and the brand matured in 2008 to better reflect their customer base. They kept the same owners, the same management, principles of service ans commitment to exceeding the expectations of their customers. It’s no surprise Red Bank Limo has been voted 2010 Operator of the Year by Limousine and Chauffeured Transport Magazine. I’ve asked Bill to guest post to give more information both about his business and how the chamber has benefited it. I don’t do any traditional advertising anymore. I call that “Hope advertising”… “I hope someone sees my ad”. “I hope someone calls me”. Instead, I do relationship marketing, then follow it up with making sure we deliver what we promise. This is exactly what the chamber does for people, it gets them noticed. And you’ll also notice other people so you now will know someone when you need a product or service. People do business with people they know like and trust. I often say I do a lot of business with chamber members and chamber members do a lot of business with me. Networking has been an incredible tool for me at Comfort Inn Middletown. Without it, I’d be sitting in my office with not very much to do. Great connections are made for yourself, or by you for others at Chamber events. It’s well worth your time and morning to come meet business owners and decision makers in your community. If you are not quite comfortable coming out and not knowing anyone, here’s me and here’s Bill. Seek us out and we’ll gladly introduce you to other people you might want to know. For some handy and well laid out tips on networking, I urge you to read this piece from Passive Panda on 24 Networking Tips That Actually Work and locally, Springboard PR blog poster Allyson Pryor recently wrote about Impress On The First Impression which is well worth the read. I encourage you to attend, if for no other reason than Bill is a great speaker and I’m sure he has something entertaining planned. I’d love to meet you, I know Bill feels the same way so I hope you’ll join us. If you would like to see who will be there and RSVP yourself, click this link to the Facebook event page. Kick Cancer Overboard Networking Event Tomorrow Night! Join all Chambers of Commerce, Monmouth Ocean Development Council, Rotary, LeTip, BNI, and many other networking groups on Tuesday, March 1, 2011 from 6:30pm to 9:00 pm at Middletown Arts Center. Located across from the Middletown train station. Emcee will be Donnalyn Giegerich, MBA, CIC, RYT www.donnalyn.org Professional Speaker, Insurance Pro, Courageous Cancer Couple Survivor, Model and Pageant Winner for Rare Cancer Awareness. “Passion for a Purpose” with Pageant Winners, Cancer Fighters, and Zoie, the dog. Let our models move you to health and happiness! Celebrity stylist Christie Maruka of Fashion Fix is our clothing sponsor. Fashion Fix is the Ultimate Mobile Shopping experience, and Christie is the stylist for the hit reality show “Jerseylicious”. Live Entertainment by Goodbie Amy, Tom Minson and Original Sin. Let the sound of the steel drums sway you away from the winter doldrums. Refreshments by Ambrosia Personal Chef Service www.ambrosiacook.com Tropical/Hawaiian Attire encouraged! Many surprises! To help us Kick Cancer Overboard, we ask for a small donation of $15 cash/check please, at the door. Please RSVP ASAP as the seating for the Fashion Show is limited to 250! The first 100 RSVP will receive a free, official Kick Cancer Overboard T-Shirt! Don’t miss the boat! AND bring plenty of business cards!!! The first time I posted this it was through the “Press This” Button on WordPress and I didn’t know the post would end up being only the link and nothing else. Oops, we live and we learn, sometimes it’s the hard way! In any case Chris Fotache really knows how to throw a party. I went to his last event at Bar A in Belmar and it was a blast. I met a ton of great people and had a fabulous time. Check out the link to Chris’ post below and consider coming out and celebrating the new year. Biggest Business Networking Party Coming to Red Bank, on Jan 18th at Taste.